Boris Johnson and friends have come out fighting after he was rebuked by No. 10 for saying that Saudi Arabia had been “playing proxy wars” in the Middle East. He told the Prime Minister that he will not apologise for his comments, made at a conference in Rome last week. Allies of Mr Johnson said that Downing Street would have to “learn a lessons” after senior Conservative MPs came to the Foreign Secretary’s aid following the put-down. A number of senior Conservatives have come out to defend Mr Johnson’s comments. One ally said: “They will have to learn a lesson, they got their nose bloodied. “Given the amount of people who support him No 10 will have to think twice about slapdowns. “Why should a Foreign Secretary be quiet? Because it’s been done that way for 100 years? The British people are saying no, they are sick of the old order. 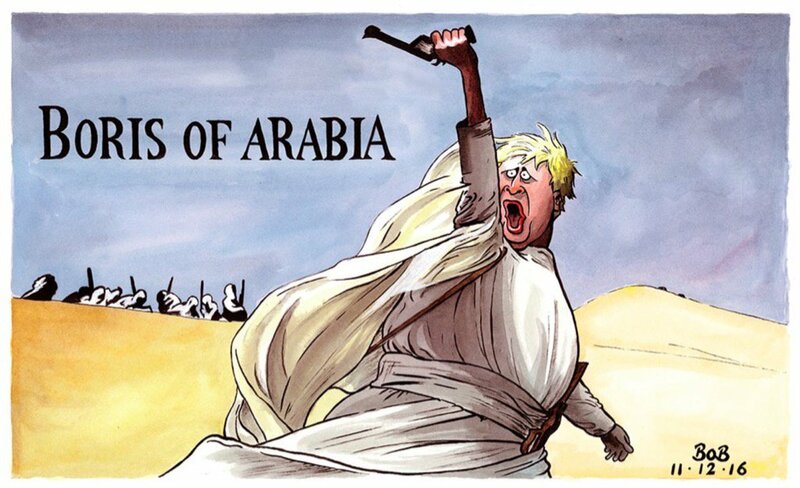 As you know the row erupted after a recording of Mr Johnson emerged in which he lumped Saudi Arabia in with Iran as he raised concerns about “puppeteering” in the region and the row doesn’t seem to be going away any time soon. 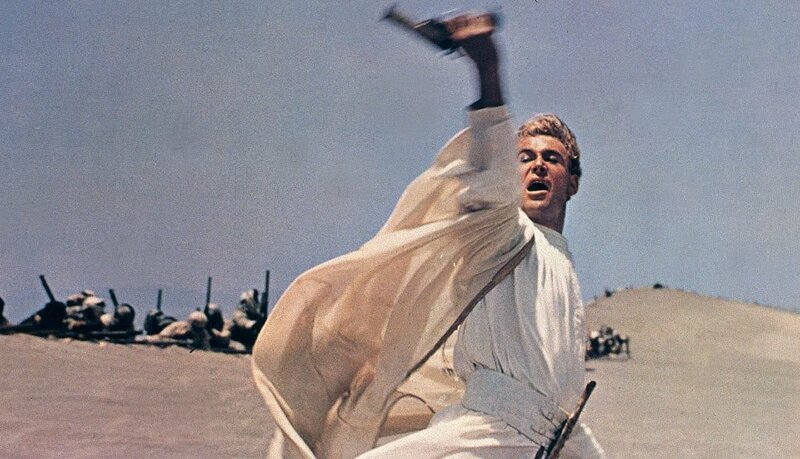 The cartoon (based on a scene from “Lawrence of Arabia”) sees Boris leading his allies in the attack. Remember despite the reported incidents of civilian deaths and the worsening humanitarian situation in Yemen, the UK has signed off £3.3bn in arms sales to Saudi Arabia since the start of its offensive. 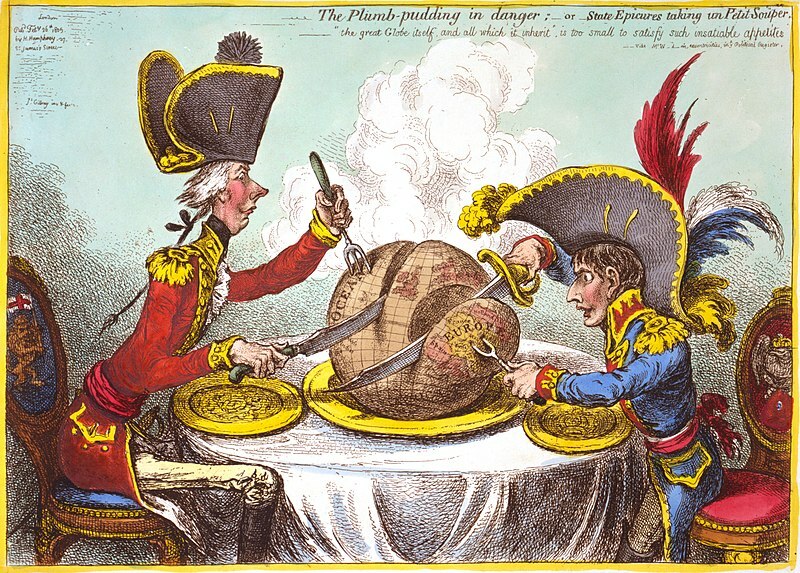 This entry was posted in Referential Cartoons and tagged Boris Johnson, Peter Brookes, Saudi Arabia on December 11, 2016 by Chris Walker. Today’s cartoon that references a piece of art is not referencing a painting, drawing or classical work – but a film. Stanley Kubrick’s Dr Strangelove. Theresa May distances herself from Boris Johnson’s comments on the House of Saud running proxy wars and puppeteering in the Middle East. 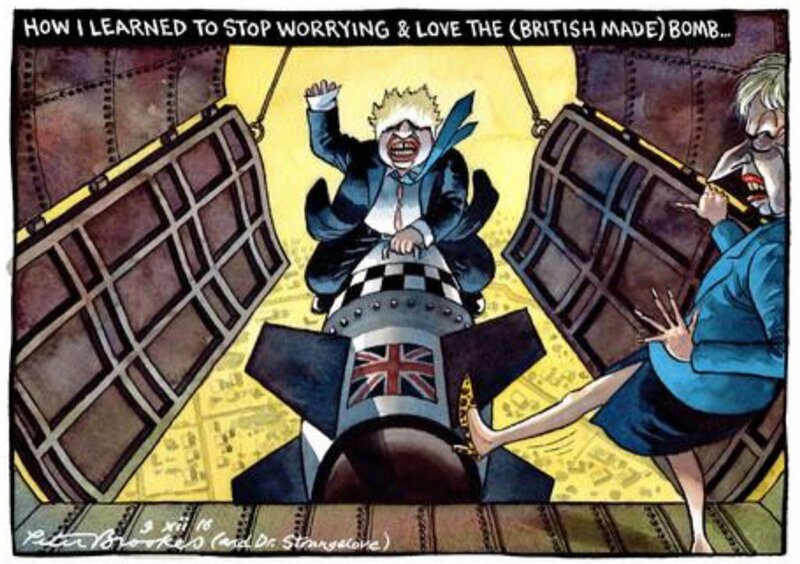 She is seen in the cartoon kicking Boris, riding a British made bomb, out of the bomb bay. UK Foreign Secretary Boris Johnson has been slapped down by Theresa May for his comments on Saudi Arabia’s role in the Middle East. Footage emerged from an event last week at which Mr Johnson said: “There are politicians who are twisting and abusing religion and different strains of the same religion in order to further their own political objectives. That’s one of the biggest political problems in the whole region. Downing Street said Johnson’s comments on Saudi Arabia do not represent “the government’s position”. The PM’s spokeswoman said the comments were the foreign secretary’s personal views. Which is a bit strange, because BoJo, as Foreign Secretary IS part of the Government. It has also emerged the the UK is doing more than just suppling tonnes of arms to the Saudis apparently sources have confirmed that six experts are working with Saudi targeteers who select locations for attack. The Ministry of Defence (MoD) in London insists they are not part of any direct operations but are training the Saudis to comply with the international rules of war. 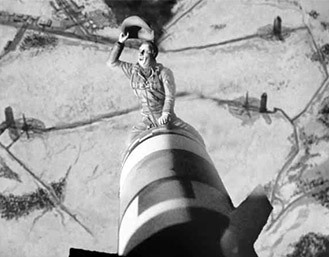 The reference to the film is one scene where at the end, B-52 pilot Maj. “King” Kong played by Slim Pickens — goes to the bomb bay to manually release the stuck bay doors on his damaged aircraft, thus enabling him to complete his nuclear attack run on a Soviet target. But just as he celebrates his accomplishment with a bit of hootin’ and hollerin’, the bomb on which he was seated is dropped. He rides the device all the way in to the target, wildly whipping his Stetson hat around as he plummets to a thermonuclear death and a blaze of glory. Kubrick was a visionary, but let’s hope not this time – “Gentlemen, you can’t fight in here! This is the War Room!” Genius. 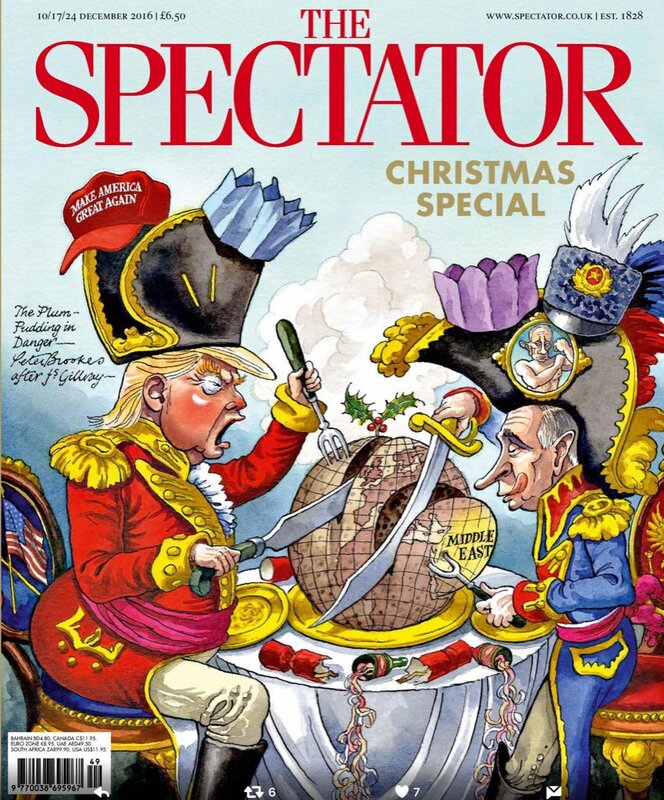 This entry was posted in Referential Cartoons and tagged Boris Johnson, Peter Brookes, Saudi Arabia on December 9, 2016 by Chris Walker.